In an effort to show visitors the most comprehensive views and complex workings of the first reusable spacecraft, the museum hired Fuel180/point2explore to develop a fully interactive touch screen program. The Museum of Flight’s newest permanent exhibit surrounds the Space Shuttle Trainer actually used by NASA astronauts. 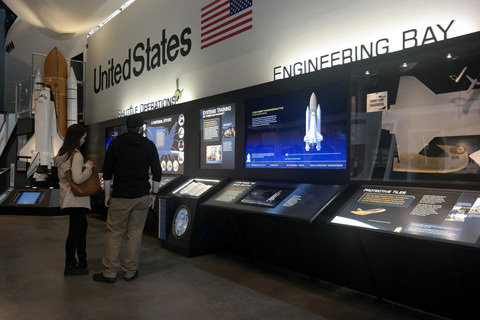 The Spaceflight Academy exhibit offers visitors to the museum a vast amount of information about the Space Shuttle and its explorations. The program includes nine highly detailed 3D models of the space shuttle which users can manipulate in the program’s eight different “tours.” Using easy to use, on-screen navigation, users of the touch screen program can interact with close up and exploded views of the Shuttle’s systems to gather a vast array of technical information and fun facts. Users control the program using a 27 inch touch screen display while the content is duplicated on a larger 70 inch LCD display mounted above the touch screen console. Since it’s opening, the exhibit has been a great success and according to PJ Müller, Exhibit Designer at The Museum of Flight, “People young and old are already making great use of the program and really enjoy interacting with the 3D Space Shuttle animations.